As the software and hardware technology advances, mobile GIS has become a more critical player than ever in the discipline of field surveying. 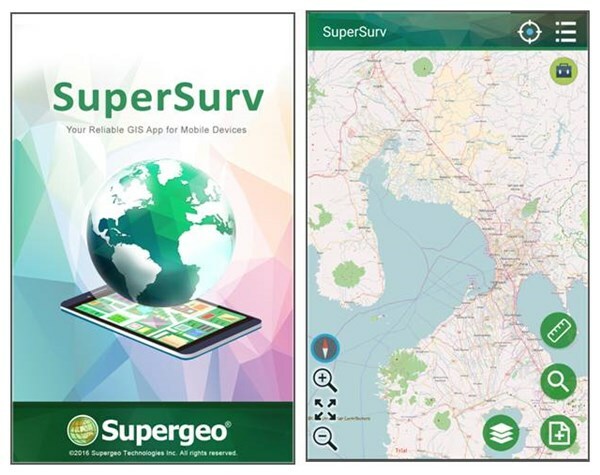 Conforming this trend, Supergeo launches SuperSurv 10 to provide convenience and gain efficiency for field surveyors. SuperSurv 10 offers abundant well-designed features, allowing users to get excellent results with its friendly user interface and simplified operations. SuperSurv 10 supports Android mobile devices with four main functions: survey, query, measurement, and layer management. Users can flexibly utilize them to fit various needs. Fig.1 New Interface of SuperSurv 10 enlarges the map view significantly. The survey function now enables users to edit data which contain Z value. And also, SuperSurv 10 provides two modes in data editing, which can be switched by tapping on the screen. According to different requirements, the query function provides three modes for users to select, which are attribute query, identify query, and coordinate query. The measurement function allows users to measure the distance between points or the area within a polygon. And the result will be displayed in the upper-left corner of the screen instantly. Furthermore, users can switch unit of the result to either metric or imperial if they want. We’ve also made a great improvement in the layer management function, which will help users view, search and edit attribute data with ease. You can check all attribute data in a short time, and edit the value while reviewing your attribute data. In addition, to save more time, the layer management function supports users to download and upload data to Google Drive or Dropbox. What’s more, users can utilize Geospatial PDF, a newly supported format in SuperSurv 10, as basemaps to enrich the spatial information. Aside from the main functions mentioned above, there are even more recently augmented functions in SuperSurv 10, such as position information and OGC services. In position information, many services are ready for users to select. You can use either built-in GPS or external device to get the position information. 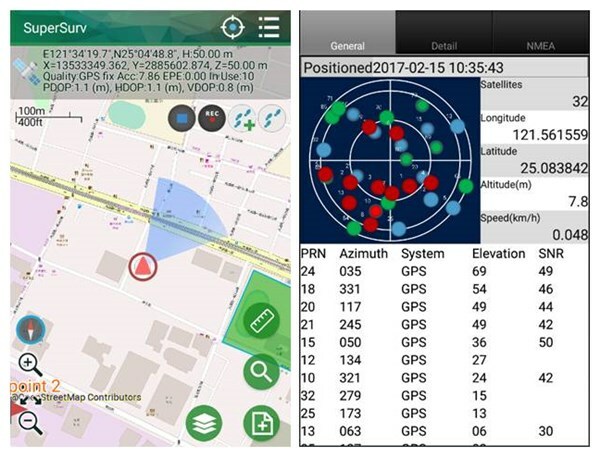 The redesigned location information page would show the reference number of GPS satellites from which the device received the signal. Different GNSS systems are displayed with different colors, making them easier to be recognized. Another appealing feature is that users are able to switch different display of coordinates as well as check precision indices, including HDOP, VDOP, PDOP, Acc and EPE, at the same time. In OGC services, both WMS and WMTS are available for users to get the maps through the internet for further applications. Fig.2 Access detailed position information in SuperSurv 10. With all user-friendly design and improved functions mentioned above, SuperSurv 10 not only increases efficiency but also enhances the functionalities and stability in comparison with series 3, Want to spend less time and be more productive in the field? SuperSurv 10 will be your best choice!